On the 18th September 1945 an important meeting was held at the British Embassy in Paris. 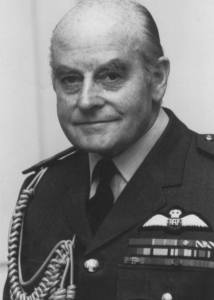 Participants included Air Chief Marshal Sir Basil Embry (RAF), Donald Darling (Intelligence Officer, Diplomatic Service) and Georges Broussine (Escape Lines). Two main points were confirmed: the name of a proposed new society; and that the new society would be supported and under the direction of the RAF. Eligibility for membership of the society was that members were to be drawn from all Commonwealth, Dominion and Allied Air Forces who had served within the structure of the Royal Air Force during WW2 and who had escaped or evaded between September 03 1939 and May 09 1945 [for the European and the Middle Eastern theatres of war] and between 08 December 1941 and 14 August 1945 [for the Far East theatre of war]. WAAF Intelligence Officers sifted through over 125,000 MI9 records of aircrew evasions during WW2 to confirm eligibility for membership. The Society under formation was the Royal Air Forces Escaping Society, the first meeting of which took place on the 03 May 1947 at the Bush House Restaurant, on the Strand in London. A membership list, dated 31 December 1947, lists 552 aircrew evader members and there were also records of many thousands of helpers from nine different countries. In 1957 the Australian Branch of the RAFES was formed and in 1965 the Canadian Branch followed. The RAFES was not just a ‘social club’; the members considered it their aim and their duty to repay their helpers for the assistance that they had received in order to remain free and ultimately to return to their units in England to continue to pursue the fight for freedom. By various means, such as television appeals, air shows and other events, the RAFES raised considerable funding to support their helpers, many of who had suffered appalling treatment and deprivation at the hands of the enemy for aiding Allied personnel. Members co-operated with the production of the BBC television series ‘Secret Army’ in order to raise the profile of the clandestine operations and courage of the helpers of the escape lines. At the age of 70, Elizabeth Harrison the Secretary to the Society, undertook a sponsored tandem parachute jump as her contribution. In the 80s and 90s other events were organised to raise funding for the RAFES, including the marathon events from Brussels to St Jean de Luz, ran by representatives of all Allied Air Forces in WW2. Later came the Home-Run Challengers, volunteers from the post WW2 Intelligence Corps, who raised sponsorship for the Society by retracing an amalgam of all escape line routes from Norway to Gibraltar using the modes of transport that had been used by the WW2 evaders – parachuting, boating, walking, cycling and swimming. For fifty years the RAFES kept in touch with, and supported, its helpers. The members have never forgotten the help they had been given by these courageous people and have attempted to repay that kindness by: giving practical or financial help when needed; looking after the children of helpers; assisting families who had lost family members in the war; organising events throughout Europe; keeping in touch through visits, and by sending every helper a Christmas card each year. The RAFES has continued to accept responsibility for the welfare of their helpers over the years; for example the small granddaughter of a French helper lay gravely ill and was not expected to live. Yet by informing his evader of the impending tragedy a chain reaction began within the RAFES. Three days later contacts had located a specialist and a hospital that could treat the child – she lived. 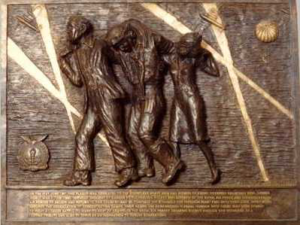 As a tribute to the helpers an RAFES plaque, designed and sculpted by former RAFES Secretary Elizabeth Harrison MBE, was erected in the Chapel in the crypt of the RAF Church of St Clement Danes on the Strand in London. The plaque depicts an airman being supported by two helpers, with another airman parachuting down near by. Additional plaques were cast and placed in: the RAF Museum at Hendon; The War Museums in Ottowa / Canada and Canberra / Australia; The ‘Musee de L’Armee Les Invalides / Paris; The National Resistance Museum in Overloon / Netherlands; and the Basilica in Brussels / Belgium. Recently, a final casting was privately placed in the RAF Club in London in memory of evader Al Day and all the ‘helpers’ of WW2. The RAFES officially closed on September 16th 1995 at the AGM in Lincoln, fifty years after its formation in Paris. However, the contact with helpers did not cease. The main RAFES Standard was paraded at Lincoln Cathedral for the last time on the 16th September 1995 and laid to rest. RAFES members paraded for the last time as members of the Society. The continental Standard was laid up in the British Embassy in Paris. Old soldiers do not go easily. 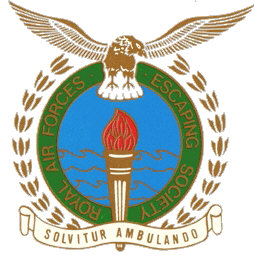 Many RAFES members joined the WW2 Escape Lines Memorial Society and continue to maintain contact with and support the helpers from a new platform. In fact Air Chief Marshal Sir Lewis Hodges, the last President of the RAFES honoured ELMS by also joining the Society and becoming its first Patron. The memory continues. Further information about the RAFES can be found stored in 38 numbered boxes in the archives of the Imperial War Museum in London. It can also be found on the 207 Squadron RAF website ran by Mr F Haslam. The ELMS collective archive holds a large amount of information and research about WW2 aircrew escapers and evaders. Please contact ELMS for further information.